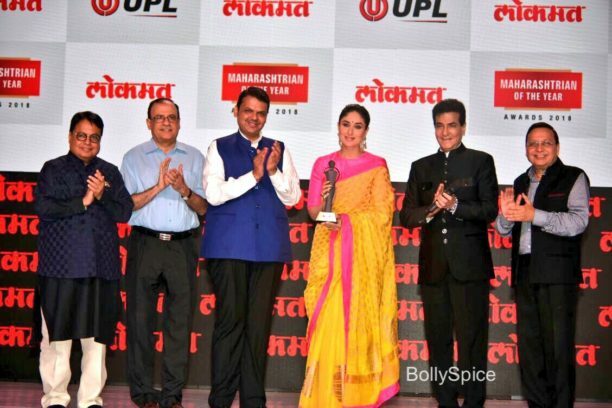 Kareena Kapoor wins the Lokmat Maharashtrian Power Celebrity of the Year Award! Kareena Kapoor Khan has managed to stay at the top of her game and ruled hearts for over a decade . The superstar isn’t just a favorite within the Indian film industry but is also one of the most sought after brand endorsers in the country today. From working with the biggest stars and filmmakers to proving her mettle as an actress who has aced both the commercial and content driven space , Kareena Kapoor was awarded the Lokmat Maharashtrian Power Celebrity of the Year Award! The Lokmat Maharashtra Awards were also attended by Hon CM Devendra Fadnavis, superstar Akshay Kumar, Kapil Sibal Former Union Minister ,Piyush Goyal Minister of Railways & Coal, Ravi Shastri Head Coach of the Indian Cricket Team among others.